You don’t need a car to enjoy the beautiful New Forest National Park. The forest village of Brockenhurst is perfect for a car free holiday. Our hotel, Cottage Lodge, is just 7 minutes walk or a short taxi ride from the station. Whether you come without the car or just leave the car in your reserved parking space in our car park, there is plenty to do without the ‘wheels’. 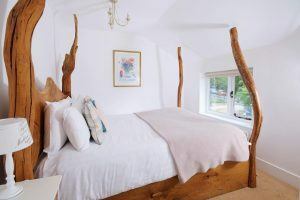 Stay with us, the eco-chic Cottage Lodge Hotel, in a beautiful forest hotel room. Bring your bike on the train. Or hire one from Brockenhurst railway station. We have bike storage at the hotel. Just bring your bike lock. It your bike is particularly valuable choose a room with a garden and you can keep the bikes in your garden. Don’t forget to bring your walking boots and explore the forest on foot as well. 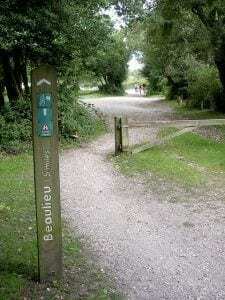 Or catch the train to Weymouth and take in sections of the south coast path. Buy a ticket for the summer tour bus and enjoy a wonderful relaxing beach and forest holiday, away from the stresses of life. Choose us and you are in safe hands. We are listed as the no1 hotel in the area for service and friendliness. After a busy day in the forest there is the wonderful White Tails restaurant at the Cottage Lodge. 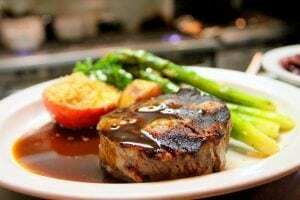 Run as a separate business by passionate chef Martin Packard, White Tails is a very popular restaurant. There are three great pubs just around the corner where you can have a pre or post dinner drink. And, if you get peckish, you can help yourself to free tea and cake through out your Cottage Lodge stay. There is no problem getting here. 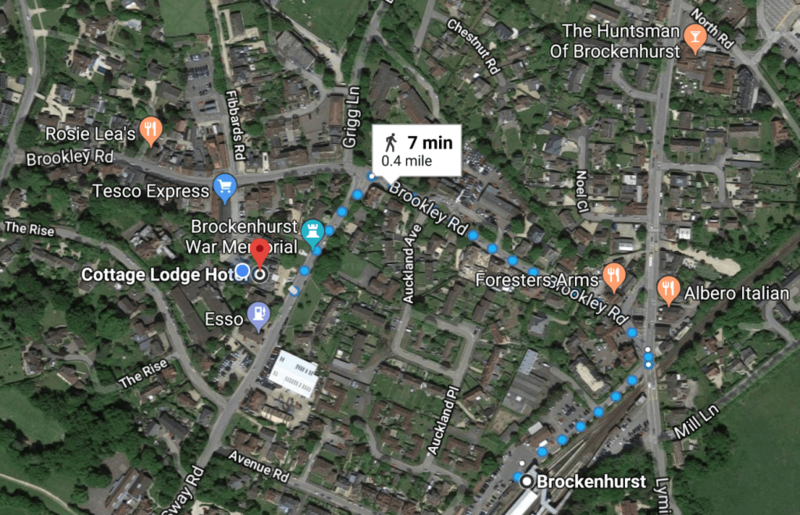 If you live near a railway station you can get to Brockenhurst with ease. Brockenhurst railway station has 160 stopping trains a day, linking this South Coast destination to the rest of the country. Just 90 minutes from Waterloo, and 2.5hours from Birmingham, Brockenhurst is really easy to reach. And, during the summer the New Forest Tour Bus is the perfect, stress-free way, to see the National Park. It stops outside our hotel and in all the railway stations, so you can leave the car at home. If you do bring your car you can leave it in the hotel car park during your stay. The buses range from open to closed top, or bottom deck traveling. The three routes are: forest (green route); coast (blue route); or wild northwest (red route). You can even hop off one bus through the forest and hop onto another, going through the stunning scenic views of the coast. You can enjoy a bird’s eye view of the landscape, tree top views and roaming animals, much better than if you were driving yourself. Bringing your journey to life through the audio commentaries, sounds and stories provided on route. Traveling around the forest couldn’t be easier. Hop on and off the buses, with or without your bikes, following walking routes and enjoying lunch in the forest… all of this without the trouble of parking. Some of the tour routes also include free transport via train and ferry links to alternative parts of the New Forest. You will be amazed at how far you can go and how much you can see without a car. 1. Walk in the 94,000 acres of open forest along beautiful trails. Take a picnic and drink in the beautiful scenery unchanged for over 1,000 years.Enjoy being alone with the forest and watching the New Forest ponies with their newborn foals. Watch herds of deer, cattle, donkeys and later in the summer pigs. 2. 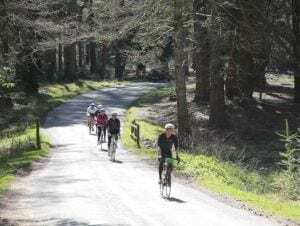 Cycle 92km of off road logging trails and stop….. Have a wonderful lunch in a pub and cycle gently home.There is a place to store your bike. Just bring your bike lock with you. If you hire a bike from Cyclexperience they are happy for you to keep it at the Cottage Lodge overnight. They hire a range of bikes including tandems and other fun bikes. 3. 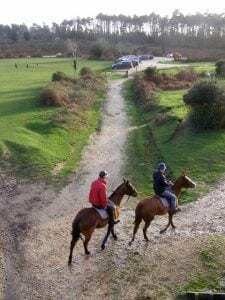 There are not many places where you can ride a horse into the Forest.Horse Ride through the beautiful new forest straight out from the stables into the forest. There are 2 stables where you can book your horse and ride for £35 for an hour on a supervised hack. 4. 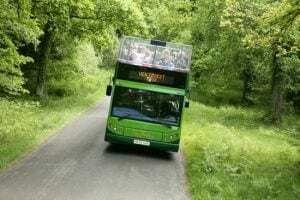 Take the summer New Forest Tour bus and see the forest from the top deck. Hop off at Beaulieu and Exbury Garden. Or head for the coast and try sunbathing on the beautiful forest beach. 5. 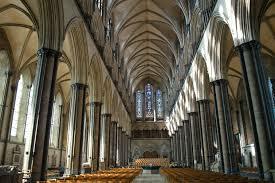 Take the train to Winchester and see Norman city that William the Conqueror turned into his capital. Lots of history and beautiful boutiques to explore. 6. Take a history walk around Brockenhurst and see the world war one hospital sites . 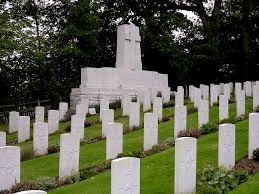 Visit the New Zealand, Australian and South African war graves in the 1000 year old Normal Church of St Nicholas.These wonderful graves are situated in the historic graveyard of St Nicholas, a Norman Church steeped in history, very close from our hotel. 7. Take a spa day at Carey’s Manor. An award winning Thai Spa, at Balmer Lawn Hotel or the New Park Manor Hotel and Spa, all of them are walking distance from our hotel. Choose from afternoon tea and champagne spa days as well as full day spa treatments. There you can experience whirlpools, steam rooms, tropical storm showers. 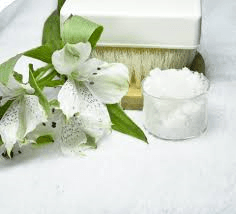 There are a wonderful range of relaxing treatments for you to enjoy. 8. Dine at our very own White Tails restaurant, run by the passionate Martin. Or eat at any of the 31 restaurants, cafes, tea shops, fine dining restaurants, take aways and pubs in the village of Brockenhurst. 9. Visit the Isle of Wight, you can get one ticket from Brockenhurst railway station all the way through to the ferry and the tour bus on the other end. 10. Be adventurous and head for Weymouth on the train and enjoy a truly British summer day out complete with candy floss and slot machines. You can pick up the South Coast trail and walk the stunning Jurassic coast. These are just 10 reasons to come, we can help you to organise your perfect holiday.